While eating lunch at Rolberto's in Twin Falls someone exclaimed, "what in the world is going on out there?" I rushed outside to take this picture in the parking lot. Twin Falls is not particularly large, boasting a population of just over 35,000. 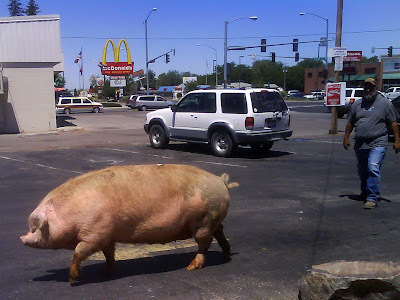 However, it is the largest city within 100 miles and it is quite unusual to see a pig walking around next the the busiest street in town.